(Bloomberg) -- If you ask, investors will tell you. Stocks are off to the best start since 1998. Central banks have been defanged. There’s more room to run, so now’s the time to jump back in. One problem. They won’t. First they watched in horror as the S&P 500 plunged 19.8 percent. Then it was envy as shares bounced almost all the way back. Now they don’t know what to do. A Charles Schwab Corp. survey finds that 81 percent of active traders on their platform believe now is a good time to be buying. Yet nearly half of the same group have been raising cash. Huh? Anyone can be forgiven for vertigo after the events of the last six months. Traumatized by the worst fourth quarter in 10 years, precious few jumped back in before the best first quarter in 20. Rather than feel confident, investors find themselves torn between terror and regret. And that’s shown up in the S&P 500 over the past two weeks. After finally climbing above the 2,815 level that had capped prior rallies, the benchmark has gyrated in a tight range, rising just 0.3 percent. The conflicting emotions come about when markets turn on a dime. A Christmas Eve meltdown was followed by the best day for stocks since 2009. While everyone was deriding the initial burst as a “bear market rally,” Federal Reserve Chair Jerome Powell decided to flip the script on interest rates. In a few weeks, $5 trillion had been added to the value of shares. It’s not just mom and pop who missed the run higher. As stocks rallied into January, quant investors cut their exposure to U.S. equities. And entering February, hedge funds had the least amount of exposure to the stock market in a year. Foreign investors also sold into the start of the year, according to Ned Davis Research. Even now stocks still aren’t seeing much love -- more than $20 billion flowed out of equities last week, according to Bank of America research citing EPFR Global data. Some investors have waited for a plunge back to the December lows to get back in. It hasn’t come. And while others may still believe global growth is receding and recession worries are still valid as more portions of the yield curve invert, not participating in the end of a bull market is particularly painful. In fact, being uninvested in the last year of an advance could mean forgoing as much as one-fifth of the rally’s overall return, studies have shown. Missing the beginning of sudden rallies weighs on a portfolio. 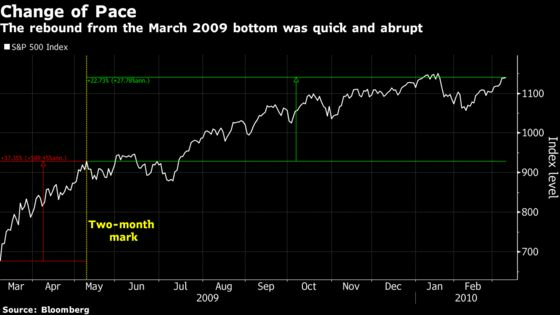 After markets finally bottomed in March of 2009, the S&P 500 surged nearly 40 percent in the two months that immediately followed. And while stocks continued higher the rest of the year, the pace of the gains was decidedly slower -- the following 10 months saw the benchmark rally half the amount seen in the first two. 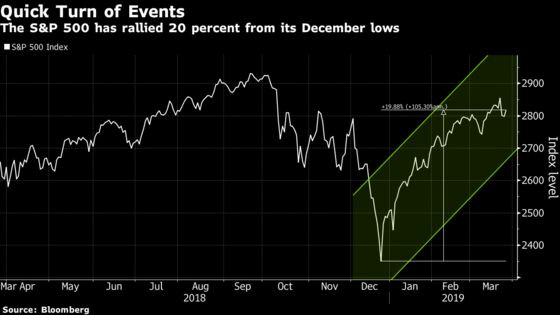 Strategists around Wall Street are on board with the rally, with some being forced to raise their year-end S&P 500 targets as the rally persists. RBC Capital Markets and Credit Suisse both raised their targets last week. Now, Bank of America is relaxing its defensive stance, citing an improving policy backdrop in the U.S. and signs of stabilization in Europe and Asia. But building trust that a jump in stocks is more than just a head-fake takes time. Just as they were after the global financial crisis, memories of violent stock market volatility from last year’s end are fresh. It affects what investors actually do with their cash.